ARGUABLY THE MOST ICONIC FOOTBALL PHOTOGRAPH ever taken was snapped nowhere near a football pitch. One of the most indelible images of the 1914 World War One Christmas truce is that of an impromptu game of football taking place in no man’s land amongst Allied soldiers. The history books state that along the Western Front around 100,000 men of various warring nations took part in the 1914 Christmas truce. Anecdotal evidence via letters sent from the trenches to loved ones at home offer comments on kickabouts taking place between rival soldiers in at least three or four locations. Just over three months later, another unlikely footballing union took place; one that was born of a desire for financial gain as opposed to peace in a war-torn environment. A game that took place in a much closer location to home than the battlefields of Ypres. 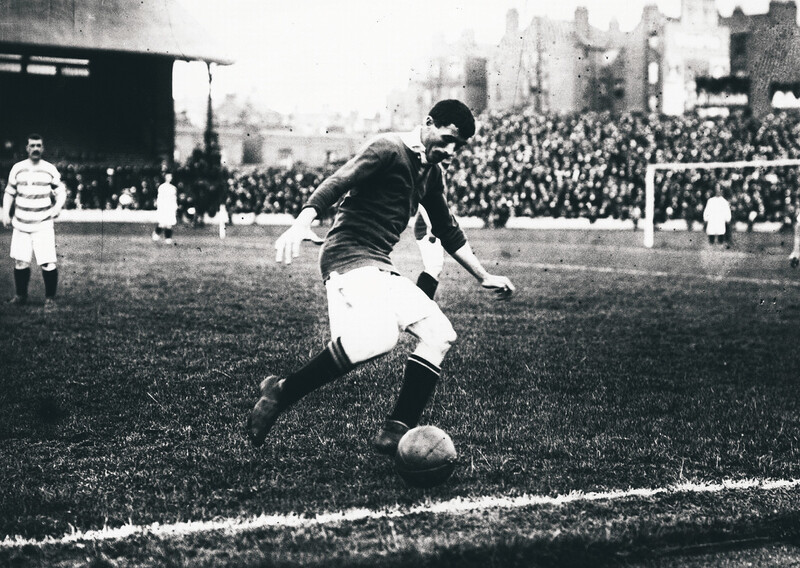 This game was played out between Manchester United and Liverpool, at Old Trafford on 2 April 1915. It was Good Friday. As the war escalated, it soon became clear that organised professional football in England would cease at the end of the 1914/15 season, with establishment antagonism so high that the Football League and the FA even decreed it acceptable that football should continue while the country was at war. At its most extreme, the football authorities, the clubs and the players themselves were painted as unpatriotic. With an uncertain future ahead of them, and their football careers potentially at an end, a number of Liverpool and Manchester United players met on a series of occasions at The Dog and Partridge pub in Manchester to discuss arranging the outcome of the forthcoming encounter between the two respective sides. Liverpool captain and former Manchester United player Jackie Sheldon – who would be cast by the eventual FA investigation as the ringleader) -was joined at the bar by teammates Thomas Fairfoul, Bob Pursell and Tom Miller, along with rival Manchester United players Sandy Turnbull, Enoch West and Arthur Whalley. When mid-table Liverpool made the trip to Old Trafford, it was to take on a Manchester United side that was embroiled in a tense relegation battle. United’s fortunes had dipped sharply from the peaks of their first coming as a club of substance after some difficult formative years when they almost went out of business. 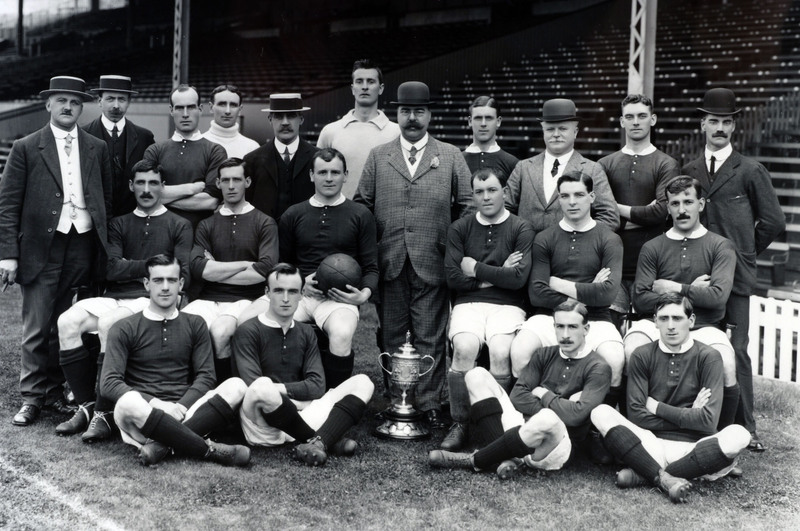 Under the management of Ernest Mangnall, United had risen from the Second Division in 1905/06 and went on to take their first league title just two seasons later, before adding a first FA Cup success in 1909 and another league title win in 1911. Mangnall had been one of the driving forces in the building of Old Trafford which the club moved to in February 1910, but left the club in bitter recrimination in September 1912 when he moved to rivals Manchester City. His last game in charge of United came against City at Old Trafford in a 1-0 win for the club he was about to join. Mangnall was reportedly openly jubilant about City’s win, with the move to his new club already common knowledge. United struggled in the wake of Mangnall’s departure and threatened a decline as swift as their rise to prominence had been. For their part, Liverpool had contested their first ever FA Cup final just the previous year, where they’d been edged out 1-0 by Burnley at Crystal Palace in what was the first final played out before a reigning monarch. The club’s first two league titles had been collected during the first decade of the century, yet despite their run to the final at Crystal Palace in 1914, Liverpool had slipped from regular title challengers to a number of seasons of mid-table mediocrity since finishing runners-up to Aston Villa in 1910. 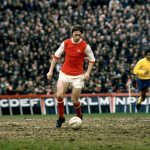 The deteriorating health of manager Tom Watson led to his death at the age of just 56, little more than a month after the events at Old Trafford unfolded. The rivalry between Liverpool and Manchester United in 1915 was still half a century away from reaching the stratospheric levels it has since gone on to inhabit. The two clubs at that stage had only really spent just under a decade getting acquainted with one another after United’s 1906 promotion. Prior to that, the great rivals-to-be had rarely shared a football pitch, although on one of the few occasions they did, it was to dramatic effect when Liverpool relegated the then-Newton Heath in the 1894 promotion-relegation test match at Ewood Park. Both Liverpool and United were effectively in the shadow of their traditional city rivals Everton and Manchester City at that stage. That was the backdrop within which United ran out 2-0 winners against Liverpool on Good Friday 1915. George Anderson scored both goals on a day when spectators, match officials and even some of the players themselves questioned various on-pitch occurrences, and the commitment shown from a number of players on both sides, the game even seeing a wildly missed penalty. With odds of 8/1 on a 2-0 victory for Manchester United being readily available, some heavy money was staked on that very outcome. Not everyone involved in the game proved to be a willing party to the attempted choreography. United’s goalscorer Anderson and in particular Liverpool’s Fred Pagnam took such an exception to what was going on that they actively fought tooth and nail to alter the contrived scoreline. 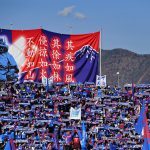 Pagnam hit the United crossbar in the final minutes of the game to the result of being openly berated by some of his teammates. Not long after the game took place, handbills and flyers began to surface outside other football grounds, raising some uncomfortable questions about the legitimacy of the game at Old Trafford, while the disgruntled bookmakers counted their suspicions and losses. The FA was left with no option but to launch an investigation into the allegations. What followed was an overly officious investigation and disciplinary commission. Liverpool’s Pagnam and Manchester United’s Anderson both testified against their teammates. The legendary Billy Meredith declared how he thought it strange how no one seemed willing to pass him the ball as the game wore on. Guilty verdicts on the seven players were finally given on 27 December 2015, almost nine months after the game had taken place, and with the suspension of the professional game due to the continuing war belatedly having been implemented. Sheldon, Fairfoul, Pursell, Miller, Turnbull, West and Whalley were all banned from football for life in a move that ultimately carried little immediate weight at a time when the game was in stasis. While West protested his innocence from the very beginning, even going as far as to unsuccessfully sue the FA, the other six players upon advisement joined up for the war effort. It is impossible to say from a century of distance what the prime motivation of joining the armed forces was for the players involved; be it an act of duty, a bid to salvage damaged reputations or perhaps a combination of both. The two points that United took from the game against Liverpool helped make the difference between relegation and survival, as the Old Trafford side averted the drop by just one point. What is certain, though, is that their actions during the war were of sufficient enough purpose for the FA to overturn their life bans upon the resumption of the Football League in 1919. While Sheldon, Pursell, Miller and Whalley returned to the game, Turnbull’s return to his club was to be a posthumous one after he was killed at Arras in May 1917. Fairfoul, by then in his late 30s, chose not to return to the game after the end of the war. West was made to wait until 1945 for his lifetime ban to be lifted after his legal battles with the FA. He was 59. Despite Sheldon, Pursell and Miller returning to Anfield, and Whalley returning to Old Trafford in 1919, all four players had moved on from their respective clubs within a year. Miller even left Liverpool to join Manchester United. The whistle-blowers fared little better as Pagnam was soon moved on to Arsenal after the resumption of the professional game, while in 1917 Anderson himself was embroiled in a match-fixing incident during a game against Burnley that eventually led to a lifetime ban and an eight-month jail term. Anderson’s ancestors today still fight to clear his name from what they believe to be an injustice. Liverpool enjoyed a return to success during the early 1920s with two more title wins, while United’s pre-war decline continued apace, and by 1922 they were a Second Division side again. Between 1922 and the outbreak of the Second World War, United spent more time in the second tier than the top tier until the arrival of Matt Busby revolutionised the club and its fortunes. The 1915 British Betting Scandal was one born of its environment. An enveloping war that was about to shut the professional game down, an uncertain future for the players that were under pressure to sign up and go into battle. The will to provide some security for the families they expected to have to leave behind them must have been massive. The mercenary appearance the whole subject seems to offer from a detached point of view a century on can’t be judged purely in black and white. While Sheldon, Fairfoul, Pursell, Miller, Turnbull, West and Whalley undeniably tarnished the game, they possibly did so reluctantly and out of growing degrees of desperation. These were players who’d already gained richly with on pitch achievement and most of them had contested FA Cup finals, which was the very pinnacle of the game for many years to come. They were a set of players who stood to lose everything for short-term gain. It is hard to imagine them doing the same thing during a time of peace.